The Paddy Power brand is notorious for attracting players with lavish marketing so no one is surprised to see their Paddy Power Bingo Summer Bargain giveaway going on right now is offering up to £2.4 million in prizes. That's right, Paddy Power's bingo site is giving away a guaranteed £2,400,000 this summer! The headline-grabbing bingo promotion is the latest publicity move by the Irish bookmaking giant, which analysts expect to further boost the brand's position as one of the leaders in the online bingo industry. Read on to find out why you want to join the fun and how easy it is to get started and win prizes! Sports betting remains a very strong component for UK bookmaking companies, but the wider iGaming sector is rapidly becoming a key part of their business strategy and revenue generation. Indeed, industry experts predict that games such as keno, slots and scratch cards, along with online bingo, will continue to grow in player numbers over the next five years, a trend the industry has clearly noticed. Bingo's potential is clearly being taken seriously by Paddy Power, a company that started out as a small Irish-based venture, and leveraged the power of the internet to become a major player. 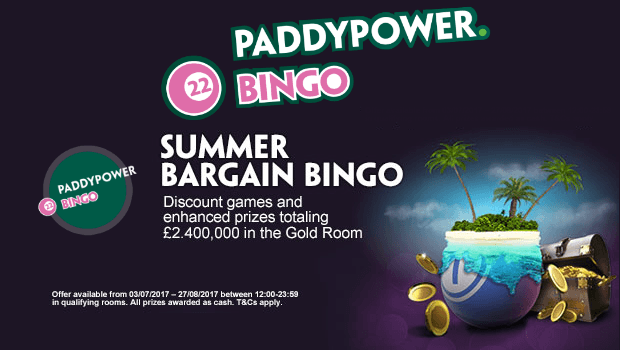 Their Paddy Power Summer Bingo Bargain promotion is a significant marketing campaign that will payout £2.4m over the summer, ending on Sunday 27 August 2017. The Paddy Power Bingo Bargain isn’t just designed to deliver the potential for big wins. It’s also looking to boost the feel-good factor across the board by dishing out a rush of lower-level wins to hundreds, or even thousands of lucky gamers. The idea so many winners could be awarded has players around the web buzzing with excitement. The brand guarantees the cash will be paid out to players, which is sure to make it very popular with recreational gamblers looking for prizes. It's not known what the biggest payout will be, but its bingo jackpots can be worth serious cash – lucky gamers regularly scoop enough money to buy new cars or go on luxury holidays. Players looking to get their share of Paddy Power's £2.4m bingo cash are required to enter the Gold Room within the brand's bingo suite between 12pm and midnight each day. Throughout the promotional period, the Gold Room will be hosting special offer games and lucrative prizes. To play at Paddy Power Bingo, players need to be existing site members, or simply register for a new account. New players can also benefit from deposit bonuses and incentives when playing at Paddy Power for the first time. Open to all UK and Irish members, the offer runs for eight weeks and is expected to see a rush of extra traffic heading to Paddy Power. Although Paddy Power's promotion is structured to payout random prizes, the spread of cash rewards means that everyone has a fair chance to win payouts. During the bingo bonus, qualifying gaming rooms will be stuffed with £40,000 in guaranteed prize money between Sunday and Thursday. Then, at the weekend, it rises to a whopping £50,000 during Friday and Saturday. Bingo players can check the playing schedule to see how much guaranteed cash is in the prize pot for each bingo game. The payouts won during the games will be shown to the lucky players within five minutes of the bingo finishing. In addition to one of the richest bingo bonus promotions seen in the history of web gaming, Paddy Power's gaming lounge also treats gamblers in one of slickest bingo casinos on the internet – featuring bright graphics, fun themes and non-stop friendly banter. The Paddy Power Bingo Bargain promotion during summer 2017 doesn't just guarantee millions paid out to players. It's also a virtual guarantee of enhanced brand visibility, new sign-up numbers and more traffic to Paddy Power's online casino, live casino, poker and sports betting sites. As well as its bingo operation, Paddy Power's slot games and scratch card sectors have experienced tremendous growth in recent times. The drive for new players has been aided by site members winning jackpots worth millions. Paddy Power Bingo consistently pays out over two million pounds in prizes every month to UK and Irish gamers. Over this summer this staggering figure is guaranteed to hit new heights. Although the firm is famous for cheeky advertising campaigns, this promotion is based on giving bingo players straightforward bonus payouts and bundles of fun. Paddy Power has gone from small-time bookie to one of the leading names in internet gambling – and it now has its sights set on becoming a major player in web bingo. Sign up with Paddy Power Bingo today for a chance at £2.4m in prizes!